First of all I have to tell you that I LOVE CHEETAH print!! I probably have 3 dresses, 10 tops, gloves, numerous scarves, earrings, etc. in cheetah print. Oh yes and come to think of it, I also have 2 cheetah print hats! I am obsessed with it! 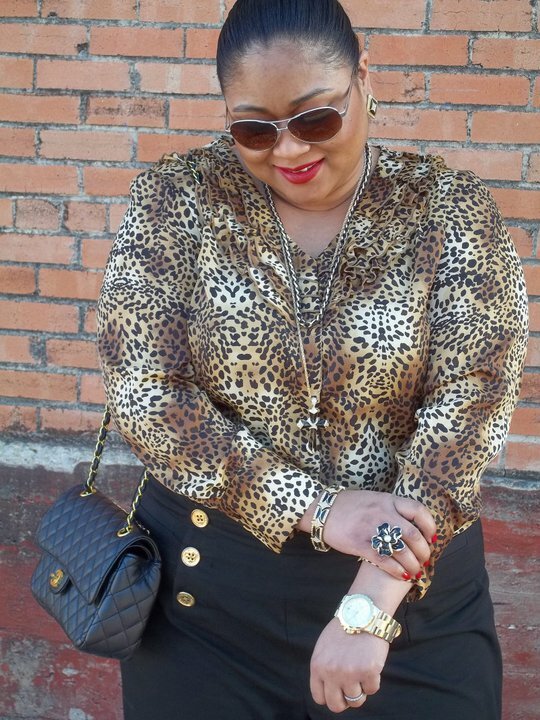 lol Today I wore my new Jones New York cheetah print ruffle front blouse. Loves it! I paired it with my wide leg Ralph Lauren sailor pants (that I need to have tailored because they are too large in the waist). The shoes are from Tar-Jay, sunnies are Kenneth Cole, Chanel purse, Michael Kors watch, all other jewelry was gifted by various family members. Have a great day! Rez, I love everything about this outfit. Leopard (check), wide leg pants (check,) Chanel bag (check), MK watch (check), and a FAB chick rocking all of the above (double check)!!!! And I forgot to mention those red lips!!!! I'm soooo jealous. My lips are way too thin to rock the red lip!! This color looks good on you! i LOVE your Chanel bag!!! Girl, you look so hot in animal prints... great , love it ! thanks for your lovely comment dear, you are welcome and it's a real pleasure to follow you too!